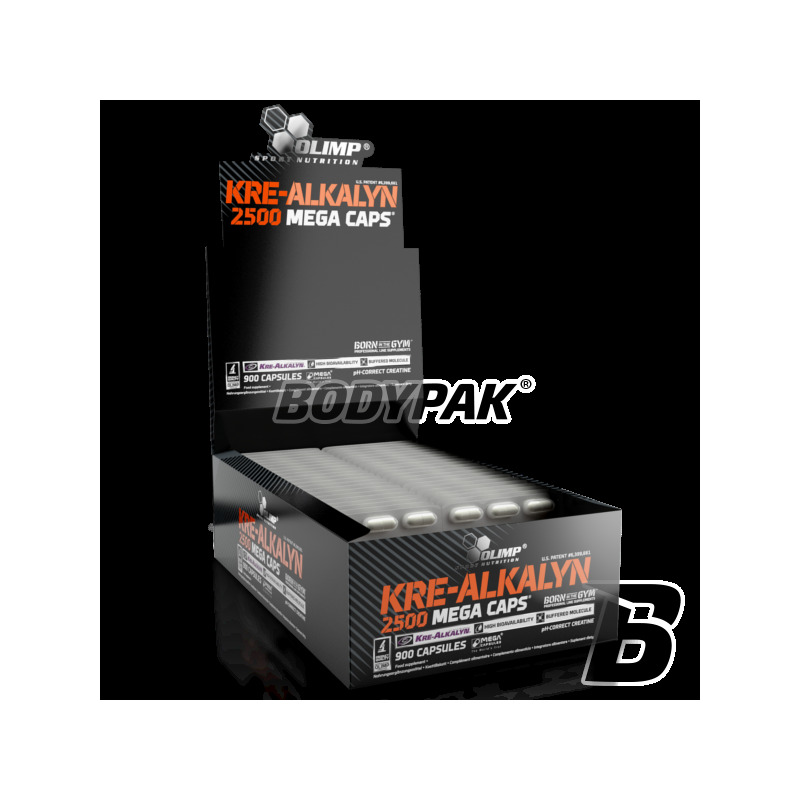 CreatineOlimp Kre-Alkalyn 2500 Mega Caps - 30 kaps. A patented form of creatine monohydrate with high bioavailability, a much better complement to creatine in muscle tissue. 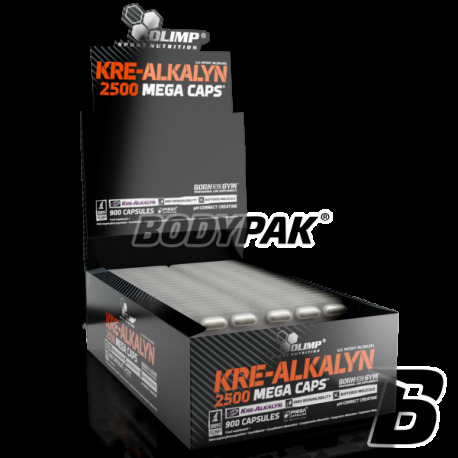 OLIMP KRE-ALKALYN® 2500 MEGA CAPS / MEGA Capsules is a patented form of creatine monohydrate with high bioavailability, a much better complement to creatine in muscle tissue than regular creatine monohydrate. Stored and transported phosphate groups to the protein synthesis and the contraction of muscle fibers. Already discoverer of creatine, Justus von Liebieg, observed in the first half of the 19th century, that is present in the solutions always, together with creatinine. These issues are the scientists explained in part in the next century, and finally, at the beginning of the 21st century. The active substance in life is creatine, creatinine and only its inactive metabolite waste. Creatine act in regulating contraction of muscle fibers and approx. 10-king, successive stages of protein synthesis of these fibers. Therefore, it is considered most effective means for supporting an effort to facilitate the development of strength and mass. Since 1992, when the creatine has become the most popular sports supplement diet, life took on the issue of its metabolite - creatinine. This is because creatinine is mainly responsible for some of the disadvantages of creatine supplementation, such as eg. Water retention under the skin. As the creatine to a large percentage turns into worthless creatinine immediately after dissolving in a liquid or gastric contents, so supplements regular creatine monohydrate supply to the muscles so very little of the active substance, and their efficiency is much weaker than one would expect after ingested dose. The researchers observed that the conversion of creatine into creatinine, and correspond to hydrogen ions (H +). The more of these ions is in admixture with water molecules (H20), the greater the acidity of the solution, that is, the lower the pH, because acidity of the environment is measured by the negative logarithm of the concentration of hydrocarbons. Because the fundamental laws of nature dictate to any environment, strive for balance, which is why aqueous solutions seek to balance the ratio between H + ions and molecules of H20. Thus, in the case of high acidity, which is an excess of H + H20 molecules are collected by the solution of all, contained therein sources. 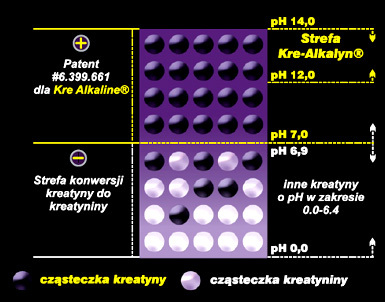 Such źódłem may creatine will happen if in solution. Then, from one end of the molecule detaches a group OH and the other is H, and the two components are combined and rear donation to a solution of H20 molecule. After separation of these two molecules, the ends of creatine are highly reactive chemically they react so as to each other and close molecule which transforms it into inert creatinine. This reaction leads to a drastic loss of creatine takes place intensively in the stomach, because gastric acidity is particularly high. It is significantly slowed down even after creatine dissolved in pure water, because the same molecule or H20 breakdown to give the H + ions. Methods for protecting against conversion of creatine to creatinine consist either end thereof for securing the binding with other substances (e.g.,. Malic acid), or mixing it with alkali - environmental removers compounds to hydrogen ions. The main disadvantage of such solutions is that - necessarily - the creatine content in the finished product to market is reduced. 1-2 capsules in the morning on an empty stomach and 1-2 capsules before training. 1-2 capsules in the morning on an empty stomach. Duża dawka kreatyny w jednej kapsułce, dzięki czemu nie trzeba ich łykać bardzo dużo. Przyswajalność wydaje się ok. Cena mogłaby być jedynie niższa..